I'm a relative newbie to posting on this forum, but have read posts and technical topics for a while. Inspired by the technical topics posted by Les Henson (which I've used), I decided that I'd do one for a TR7 forum that I'm active on, covering a rebuild of the LT77. Anyhow. I messaged Les last week to ask him how to upload this into the archive section on this site - but unfortunately, I've not heard back from him, so thought I may as well post the thread here. Now. This is a Land Rover box I'm overhauling, but I've written it for the TR7 audience. Not that that makes much of a difference, as the boxes are almost identical, but just explains the TR7 references throughout. I bought another Land Rover last summer. I got it for a good price, as it had a messy oil leak from the engine/gearbox area. It was hard to tell where exactly it was coming from, as there was oil all over the place. Anyhow, I ran it for a while, but the dripping really started to get on my nerves, so I decided to take the engine out . . . .
Motor came out no problem (left the gearbox in the car). Cutting to the chase, there were a few oil leaks, but the main problem was that on this Land Rover reconditioned engine (only done 15K ish), the rear crankshaft oil seal had been put in the wrong way round! Shocking. I had the sump, ladder, oil pump and front case all off. New gaskets and seals, timing belt etc. So the engine was all washed off, and nice and clean – but the gearbox looked filthy. So I decided to drop the box out too, and give it a good clean. Bloody awkward thing to remove due to the very unbalanced nature of it. I spent the best part of a day cleaning the gearbox and transfer box off – but the results were worth it. On inspection, I could see that there was a little oil leaking here and there. So I thought – “What the hell. I’ll split it and treat it to a few new oil seals and gaskets whilst I’ve got it out.” And boy, was I pleased that I decided to do this! When I got the transfer box parted from the gearbox I found that the mainshaft splines were about worn through (ready to lose drive), and the transfer box input gear splines were also worn out. I’d have no sooner got this all back together, and the bloody thing would have sheared the final bits of the splines off, and left me with no drive. And of course, it would all have to come out again. This was a known fault by the way on Defenders/Discoverys of this age. The later input gears were modified with lubrication holes to stop the wear. 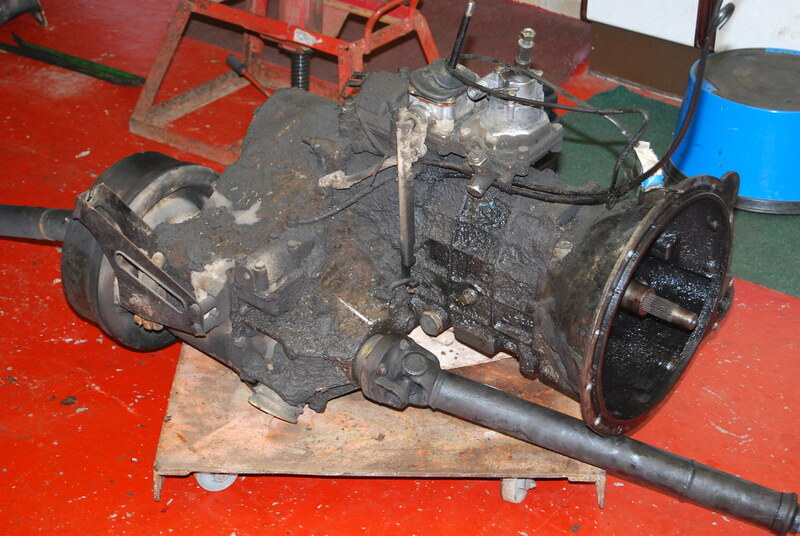 Essentially this gearbox is the same as found in our 5 speed TR7s – it’s an LT77. There are a few minor differences here and there – but not much. So I thought it would make an interesting topic. As you can see, the selector housing is different to the TR7. Again, not on TR7, but you have to do it! Remove snap ring. Remove oil seal collar. It has a groove machined in it to pick up on it for pulling – it’s tight! Remove bolts and slide off aluminium housing. Remove oil pump gears – they were worn, but very good for 115,000mls. Much better than most TR7 gearboxes I’ve split. Picking up on one of the centre plate bolt holes, lock the 5th gear – I used a bit of scrap. As the nut is staked, it’s quite tight. This isn’t a nut on the TR7 box – it’s a press on collar that you have to pull off - if I remember correctly. Remove selector and then 5th gear circlip. Remove selective spacer and 5th gear from mainshaft (3rd motion shaft). This is different to TR7 – 5th gear has a split caged bearing. Open up cage and remove. Lift off 5th gear from layshaft Can't remember if I needed a puller to do this. Or whether employed the two pry bars again - sorry, no photo. Invert casing and remove front cover, selective washers and gasket. Remove selector shaft spool retainer. Remove reverse shaft, thrust washer, reverse gear and spacer. Reverse lever pin, lever and slipper pad. Lift off constant pinion shaft (1st motion shaft). Unscrew plug and remove detent ball. Remove mainshaft gear cluster complete with selectors. Centre plate – push out bearing races (push fit only). Hold CPS in vice and pull out outer bearing race. I used my slide hammer as I don’t have an internal bearing puller. Flip over and pull other bearing race. Fitting new bearing – heat CPS to expand. Drop in new bearing outer, making sure it’s seated by tapping it home using old bearing as a sized drift/tool. I used the old bearing inner to go into the end of my ‘bearing fitting tube” (a piece of pipe). Ready to use to tap new bearing home. Once CPS has cooled, warm new bearing. Once warmed, drop onto CPS. Use tool to make sure bearing has seated properly. You find that these bearings simply fall on once heated as they expand a fair bit. But I like to be able to check that they have gone all the way home. I usually use the old bearing races as part of the tool as they are the correct size. Ok. Onto the mainshaft now. Support in vice. Slide off gear bush, spacer, cone, inner and outer baulk rings. I put a tie wrap around them to keep them all together. This is where/how you check the synchro for overall wear. You need to be able to get a minimum of a 15 thou (0.015”) feeler gauge in the gap when the synchro is properly seated. Obviously, check visually for wear, chunks missing etc. Slide off gear and bearing. Turn mainshaft round and pull off small CPS end bearing. Remove gear assembly. Tie wrap together. That’s the shaft bare now. Here’s my replacement mainshaft and transfer input gear next to the old ones. You can see one of the 4 drillings in the ‘modified’ input gear here. Clean off new shaft and blow out all oil galleries with compressed air I'm ready for re-assembly. Pull the bearings off as per all the others. Here’s the Land Rover shaft next to a TR7 one. TR7 in the foreground with smaller straight cut reverse gear. Heat new bearings and fit to mainshaft. Slide hammer to check bearings seated. Now to re-assemble to mainshaft. It’s basically the reverse of the dismantling. Lubricate bearings. (By the way. The manual describes in detail how to dismantle each synchro/gear assembly to check for wear and measure end float - where necessary using sized selective spacers blah blah blah. All bearings heated before fitting to enable assembly. So. Here’s the assembled mainshaft (rear) with a TR7 mainshaft in the middle, and the buggered shaft in the foreground. You can see the slight differences between the shafts. On the TR7 shaft I’ve fitted the spacer you have to machine up to check for endfloat on 1st gear – just in case you were wondering what it was. Onto the assembly into the centre plate. As you can see. All washed off with gasket faces cleaned. Fit bearing outer races – push fit only. Fit selector forks to mainshaft, ensuring synchro’s are in neutral position. Fit mainshaft and selectors as a single unit to the centre plate. Fit reverse gear assembly and retain with bit of metal. This is to stop the reverse shaft falling out whist continuing with assembly. Fit 4th gear baulk ring and CPS. Make sure the selector spool is in neutral position and fit the detent ball, spring and plug. Fit outer bearing races – push fit only. Fit new o-ring and fit spool retainer to casing, securing set screws with Loctite or similar. Oh yes – Loctite in detent plug. Now it’s time to make a tool to hold the front bearings in place, but mainly to take the force (as opposed to the bearing) on the layshaft when fitting the tight 5th gear assembly later. The manual gives dimensions. Take a piece of bar. Marked out and centre-popped ready for drilling. Now to make the distance piece that sits under this bar and picks up on the end of the layshaft. Disc and bar ready. You could just use a few washers of course. Disc ‘stuck’ on the end of the layshaft with a bit of grease to keep it in place. Invert box and remove reverse gear shaft holding ‘tool’. I held the box in the vice gripping onto the layshaft support bar I’d just fitted. You now have to drive 5th gear onto the end of the layshaft. So needed to make a tool to help. Used an old bearing race and a bit of pipe fitting. The bit above is a plug to go in the end of the pipe collar (to bash with a 3lb hammer!!!). Bash the bugger home! You’ll see I fitted a bit of pipe over the mainshaft. Just in case one of my heavy hammer blows went off course – didn’t want to make a big dent in my new shaft! As I didn’t have a new retaining nut I took a few thou off the original so it would stake up into new metal when re-fitted. Clocking the nut in the chuck before machining. Fit 5th gear bearing cage. Fit 5th gear ‘retaining’ tool and tighten nut to 230Nm. Measuring the inner member synchro clearance (up to 0.002”). Use selective washer to achieve correct tolerance between it and the circlip. Fit 5th gear selector fork assembly. Fit oil pump drive square to end of layshaft. New and old oil pump gears. These gears were the best I’ve evere seen. Other TR7 boxes I’ve stripped have has bits of swarf and chunks missing on occasion. Line up oil pump square drive with the oil pump. Fit gasket and offer up casing. Remember the TR7 casing is a bit different with a support roller bearing and the output flange, which is held on with a nut. Here’s a flange holding tool I made to hold it whilst the nut is tightened. But the Land Rover is a bit different as it has a collar pressed onto the mainshaft that seals the casing. The inner is sealed with an o-ring, the outer of the collar direct onto a regular oil seal. Now. I didn’t want to heat the collar to get it on as I would be likely to damage either the seal or the o-ring or both. So a different approach was needed. Here’s my assembled bits and bobs to do the job. Part off bit of scrap tube. As this was chromed, needed to machine a bit of the chrome off where I was going to weld. Machining an ‘end’ for the tube. End fitted into tube – you can just see the join. This nut is to pick up on the threaded end of the mainshaft. It’s an odd size at 18mm. Machined off nyloc bit. Weld nut onto end of studding. Drill clearance hole for studding to pass through. I was going to use that welded on nut as my holding point for this tool, but decided against that, and ground the nut off. Bored nut out to OD of the tube. Finished tool ready for action! Screw nut/studding onto end of mainshaft. Fit snap ring to shaft. Now we’re up to sorting the endfloat/preload on the main and layshafts. Invert gearbox. Fit spacer to mainshaft, and measure clearance as per manual. Land Rover manual shows you how to measure using feeler gauges. I preferred to use a DTI as per the TR7 manual though. Remove packing piece, and repeat for layshaft. You have to use the feeler gauge method for this shaft. Replace shims as appropriate. I needed to buy one, but managed to grind another down on a diamond stone. Fit correct size shims, oil seal to housing, and then housing to casing. These next few pics are just of the gear leavers going on (all stripped and re-greased). In constant need of Instant Mechanical Gratification! Nice job... you make it look easy with all the tools! A well written thread and some superb photos. Well done, although if that doesn't convince people to go to Ashcrofts nothing will! and thanks for the nice comments . I'm pleased to have been able to do it, as it goes someway to repay all of the top tips I've found so useful on here. Western - I know you said to link to the technical archive, but I don't know how to - or is that something a moderator needs to do? He's already done it - it sits proudly with all the other good articles in the tech archive. I'm sorry - but you're going to have to point me in the right direction, as I can't find it at all!!! This is a superbly written and, most importantly, well illustrated piece of work. Its also of huge value to thickos like me who know which end of a spanner is which but have no idea which end to use and where to put it! Even if I never need to rebuild my own gearbox, there's a lot of understanding I can gain from looking at these pics and seeing where stuff is and what it looks like, and from that work out what it does. Thanks very much for the effort - its one thing doing the job, but another completely to take such excellent images whilst doing it. Land Rovers - One Guide - Read It! great thread but i think the transfer box is my limit too much to get wrong. ashcroft will be getting my phone call later this year. I send a request by PM to the Mod of the tech Archive & include the link to the topic I want added, then it gets linked for future use & leaves the original topic intact in the this forum to be updated/commented on. Thanks again, I'm pleased you like/appreciate it. Red90 - yes I've been in that index before, but forgot it existed. Thanks for reminding me, as I'm bound to need it again. Although, you would get heaps quicker if you were doing these on a regular basis, I don't think the price the likes of Ashcroft are charging is that bad. I haven't got the exact figure to hand, but for all new gearbox bearings, the new mainshaft, new transfer gear (and its bearings), and the oil seals and gaskets. It cost me about £240. Now I could have got the parts cheaper, but that would have been for cheaper make bearings and a cheap (unknown quality) gear and maishaft off Ebay. I used Royce Power at Northallerton for my parts. They came highly recommended from an Agricultural Fitter mate of mine who uses them on a regular basis. Their service was good and do mail order if required. I have no connection to this supplier bytheway! The obvious advantage of doing it yourself of course, is you know what you've changed, and what you left as 'serviceable'. What the the two steel spring clips holding the rod to the arm? I have the replacement plastic clips for my LR but do I need the steel ones too! Those are plastic zip ties. Oooh ....ye that's wha they look lie!!! Duh!! I forgot to add that this is a great rebuild posting. All the pictures are in focus and it covers all the pitfalls that could be encountered. I wish I had seen it before I started my project. Any chance of perhaps summarising the "special" tools you used, and any possible alternatives? I know i dont have all the required tools you used, but tools can be purchased (maybe with the exception of the lathe!) and it lets you weigh up the costs compared with sending the box to ashcroft. The idea of the zip ties (tie wraps to me) are there as a precaution. On TR7s the plastic clip is similar to this and can become brittle and come off. Resulting in you having to get the gearbox out just to replace that plastic clip that keeps the rod in position. I guessed a couple of tie wraps would mean this couldn't happen - so just a precaution. Well spotted! a common precaution on LT77 & R380 clutch lever/pushrods too.